When Elena (el-en-ah) L. and Jianna K. are in a room together with musical instruments, it is pretty hard to talk to them about anything else. These GA fifth graders not only share a love for playing music, they now share a realized dream of playing in one of the most magnificent concert halls in the world – Carnegie Hall. 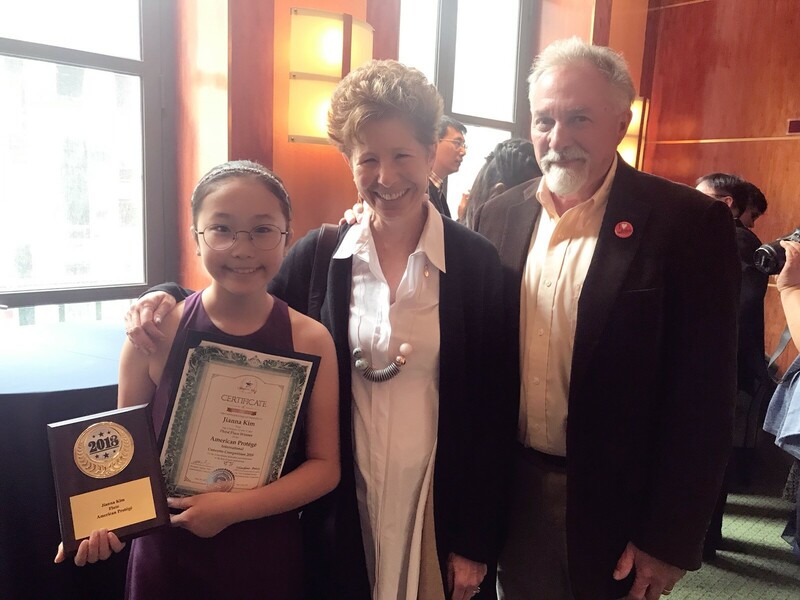 Elena, a pianist, and Jianna, a flautist, both won awards at different competitions at the famed hall in New York City this spring. Elena and Jianna both won first place in the Little Mozarts competition for ages 5-14. Jianna actually participated in three different competitions at Carnegie Hall, performing two solos and a duet with fellow Patriot Raina B. '23, where she also earned top finishes. "Playing at Carnegie Hall was a dream come true," said Elena. "I was a little nervous before it started, but I felt pretty good while I was playing on stage. I was really excited when I won and I will definitely continue to perform." "It was great to play at Carnegie Hall," said Jianna. "The best part was when my fourth grade teacher, Ms. B (Blumenreich) and her husband (below), came to watch me perform. I was more excited than nervous." When asked about her history with the piano, Elena said she has been playing since she was four years old, practices one hour a day at home, and has lessons one day per week with her teacher, Dr. Cong Fon. Elena performed Sonata in C by Haydn for her competition piece. Jianna began her instrument playing on the piccolo in first grade, and then switched over to flute in third grade. Her favorite piece is Concerto in G major by Quantz, and she practices every day for an hour or more. Jianna's flute teacher is Michael Maizeles. While it hasn't happened formally yet (CLICK HERE for the video from GA's music room), the girls think it would be fun to do a duet together on stage. In the meantime, they look forward to performing in competitions as well as Middle School concerts next year.